The trails you build ensure mountain bikers have a place to ride for generations to come, but your work requires access to land and plenty of funding. 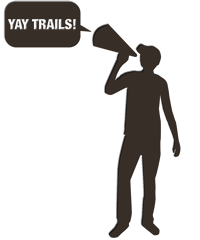 Trail Genius is the ideal tool for educating the community, landowners, donors, and sponsors as to just what you are doing out there. With the power of Trail Genius, your trails website is more than just a place to keep your trail map. It’s a tireless advocate for your trail building efforts. You know your trails rock, but if you are off the beaten path it can be hard to convince people to travel the extra mile to get there. How will you let the entire mountain bike community know it is worth loading up the car and traveling to check out your trails? Trail Genius allows you to show people how cool your trails are, all from the comfort of their home. Once they see your awesome trails in HD video, with real time stats, they will be ready to add your trails to their next adventure. The International Mountain Bicycling Association (IMBA) is a non-profit educational association whose mission is to create, enhance and preserve great trail experiences for mountain bikers worldwide. This is one of the premier organizations supporting the mountain bike community. The Bicycle Federation of Wisconsin is a statewide, nonprofit organization with more than 3,000 members. They work with people from all around the state to make bicycling convenient, safe, accessible and fun. They have a vision of Wisconsin being one of the world’s best places to ride a bike. Their mission is to inspire, motivate and unite a strong community of civic, business and political leaders, motorists and bicyclists to move bicycling forward. Located in Copper Harbor - Michigan, the Copper Harbor Trails Club (CHTC) contains some of the best trails the Midwest has to offer, and can hold its own to some of the best trail systems in the world. They received an IMBA epic rating which puts them among only a handful of the best trails in the world. The Trail Genius crew’s home stomping grounds. This is the place we first invented, developed and proto typed our Trail Genius services and online interface. How can we not support these guys. One of our members is on the board for this club, and we welcome the opportunity to support other clubs like this too.